Monday, 6 June 2011: early a.m.
With the exception of some rain wrapped and brief tornadoes in Kansas on June 1, and of course the devastating tornadoes that occurred in Massachusetts that same day, the Great Plains have been quiet as far as supercells and tornadoes are concerned for about the past ten days. The culprit is a massive heat ridge that has brought high temperatures to the upper 90s and even 100s from Texas north into Oklahoma and Kansas, eastward to much of the deep South and parts of the Midwest. But, it looks like the severe storm and tornado activity is going to pick back up again beginning today (Monday), extending through the weekend. The first setup is over the southeastern third of Montana today (Monday). I know that’s way up there (pretty close to Canada even!) where not only are there not many roads, but the terrain does become a bit hilly. I’ve chased in the southeastern portion of the state (the area I’m expecting storms), and I can tell you that even though there are gently rolling hills over this high terrain, it’s amazingly beautiful and you can really see as far if not further than you could say in the flat state of Kansas. The reason is because when you reach the top of one of the hills you are often overlooking a flatter region of the state, giving you an amazing vantage point. 00z June 6 WRF forecast valid 00z June 7 showing 850mb winds and pressures (7 p.m. CDT). Anyways, strong southeasterly to easterly winds from the surface to 850mb (upslope flow) will cause enough gradual lift due to the orography to initiate storms by the late afternoon near the Billings area. The approach of a 500mb trough will also aid in the development of storms. But it won’t arrive until later in the evening, so upslope flow will probably do most of the work. At any rate, surface dewpoints in the lower to even mid 60s are expected to advect into the area by late in the afternoon, providing more than sufficient low level moisture fore severe storms. Wind shear profiles will also be great for supercells capable of very large hail. 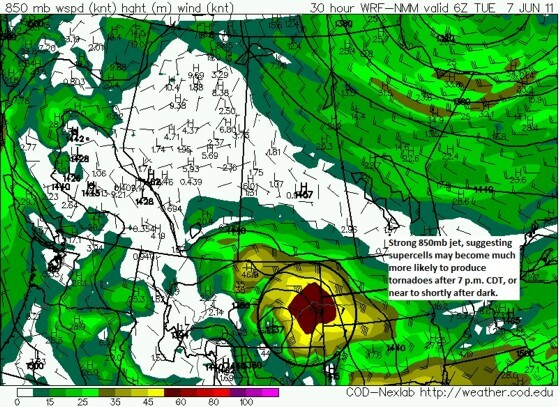 00z June 6 WRF valid 06z June 7 (midnight CDT), showing a very intense 850mb jet over southeastern Montana. As the upper air system from the west moves into the area near or just after dark, the 850mb jet will crank into high gear out of the east-southeast. I think the combination of the shear dramatically increasing after 7 p.m. CDT, the increased large scale dynamical forcing from the upper air system, combined with supercells moving further east into the lower plains with deeper, low level moisture will result into supercells becoming much more likely to produce tornadoes near and just after dark. 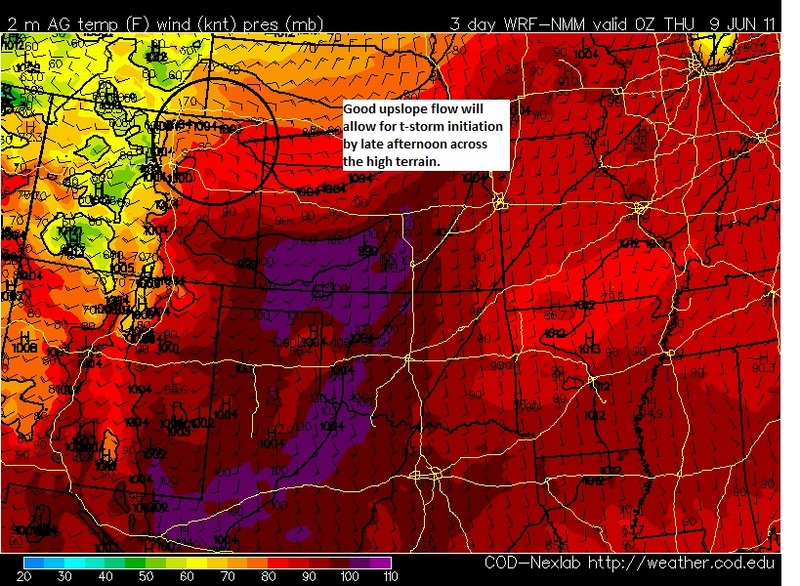 All in all, this is a pretty good setup for supercells, some tornadic, over Montana. The setup could be a little better considering the timing of the shortwave, but I’ve definitely seen much worse. I suppose I would be much more enthusiastic if the whole upper system itself would eject east a bit faster. But even so I think there could be a decent tornado or two in Montana today. Unfortunately, one or more may be after dark. The setup for Tuesday shifts much further east into central and northern Minnesota. There a surface low, dryline and warm front will develop as the leading edge of the Montana system will be ejecting eastward. The CAP will be enormously strong all across the northern plains due to very warm mid level temperatures. But the combination of deep low level moisture convergence along the warm front/dryline aided with at least some dynamical forcing should provide for thunderstorm initiation across central/north central Minnesota by the early evening hours. The deep layer shear will support supercells. 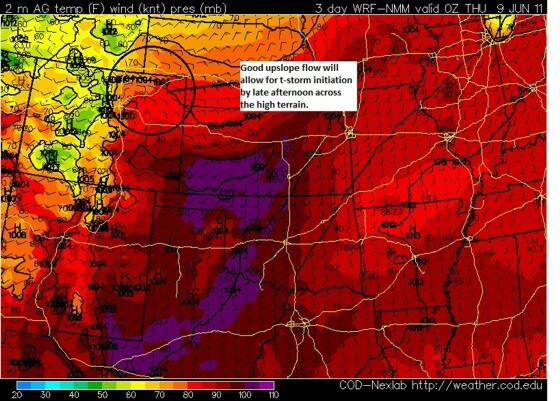 In addition, the backed 850mb winds at 30 knots will likely allow for some tornadoes to occur. Next, we head southwest to Colorado for Wednesday’s most likely area for supercells and tornadoes. At 250mb, a strong belt of 50 to 65 knot southwesterly winds will be present by the afternoon and evening hours across much of Colorado. This will provide good ventilation for supercells that develop from upslope flow over the lee of the Rockies later in the afternoon. At 850mb, modest 20 to 25 knot winds out of the east to southeast will be present, providing some low level shear for supercells, but mainly large scale lift from upslope flow. 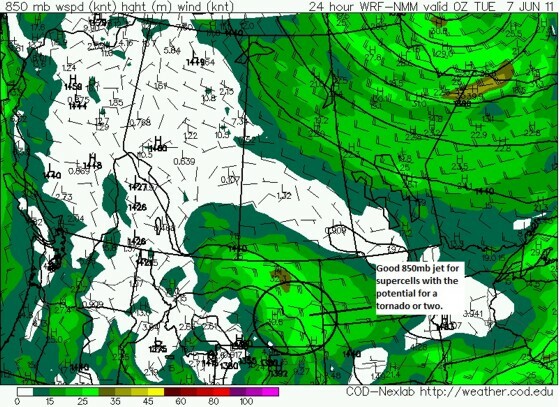 The more important feature IMO is the surface low that develops in the afternoon over Denver and deepens in the evening. To me this looks like a rather classic ‘Denver Cyclone’ setup, given it’s occurring just after a weak frontal passage. 00z 6 June WRF surface pressure and temperatures valid 00z Thur June 9. 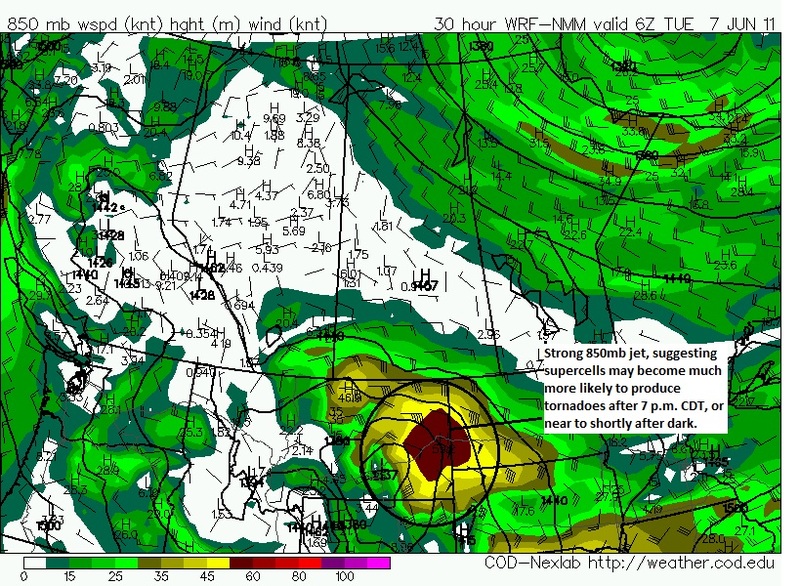 Notice the surface low over Denver...this appears like a 'Denver Cyclone' type setup. The main limiting factor for this setup is low level moisture. In wake of the frontal passage, only mid 40s to 50 degree dewpoints will be present across the northeastern half of Colorado by the early evening hours. This may not be adequate enough for tornadic supercells as the storm bases may be rather high. However, if lower 50s dewpoints can return by the early evening hours, then I think this could be quite a setup for tornadic supercells across the Denver region extending eastward later in the afternoon/evening. 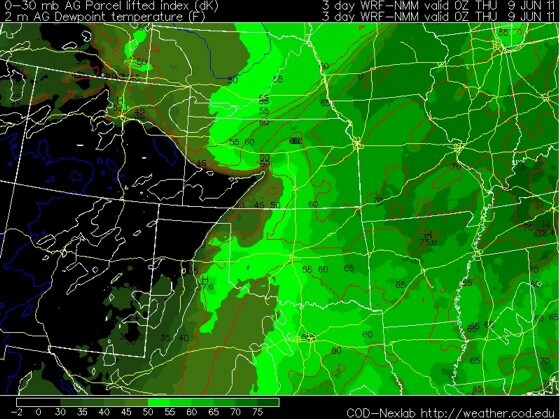 00z June 6 WRF valid 00z June 9, showing surface dewpoints. Notice dewpoints only in the mid 40s to near 50 degrees F are expected across Colorado. Then Thursday and Friday the supercell and tornado risk will extend over both Colorado and the southern/central Plains as another shortwave moves in from the west. Both days will feature a decent 850mb jet across parts of western/central Kansas into western Oklahoma and the panhandles. The CAP may be too strong further south, so it’ll be interesting to see what areas end up being the place to chase. 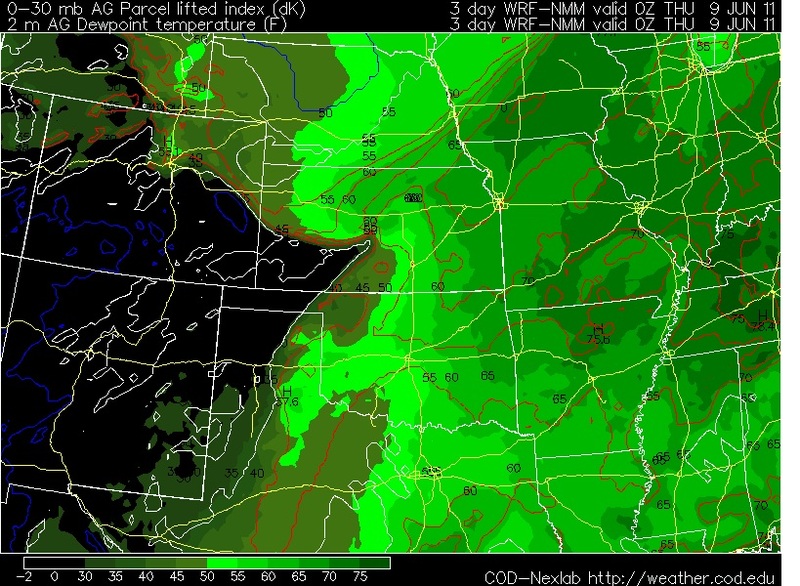 By Saturday there will remain ample moisture, instability and shear for supercells across Kansas. So after a relatively quiet period of time over the Great Plains I do think things will be picking up this week. Good luck to chasers out there and be safe!